It is time for the two countries to resolve their differences and work together. 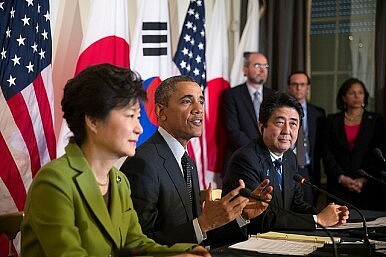 The first trilateral leadership summit between Japan, China and the Republic of Korea (ROK) to be held in three and a half years took place on November 1, and it was followed, on November 2, by the first meeting between the leaders of Japan and the ROK since the governments of both nations changed hands. East Asia in the 21st century contains the seeds for extreme instability in terms of politics, economics and security. In this situation, close cooperation between Japan and the ROK should be a given. The fact that it took this look to hold Japan-ROK leadership summit in spite of these circumstances is a political aberration that goes against the interests of the citizens of both our nations. China is the most pressing issue in the East Asia region. There is no doubt that China will have a tremendous impact on its neighbors Japan and the ROK, as well as on the entire international community. Because of this, I think that we must carefully follow political and economic developments in China, and that Japan and the ROK should cooperate to ensure Chinese society achieves a soft landing. If we can succeed in encouraging China to move in the direction of democracy, it should be able to exist peacefully with the rest of East Asia and the international community. To achieve this goal, Japan and the ROK, which share the basic common values of democracy and free market economics, should serve as the heart of the East Asian region, deepening exchanges and strengthening their bilateral cooperation. If a robust Japan-ROK relationship can be created, and a democratized China can participate to create a fully cooperative trilateral partnership, I am convinced that our three nations will be able to play an even greater role in human history than they have done hereto. When we think about the relationship between Japan and the ROK, we should consider how it can be strengthened by looking at the 2,000 years of friendly cooperation that the two nations have enjoyed. This year marks half a century since the normalization of diplomatic relations. At the time of normalization, human exchange between the two nations involved roughly 10,000 people per year, a figure that has since increased dramatically to approximately 5 million people annually. We should never forget that the background to this bilateral relationship is the accumulation of more than 2,000 years of exchanges of people and culture. During the Yamato period, when the Imperial court ruled Japan, it is said that no interpreting was required for communication between Japan and the Korean peninsula. In other words, even the language used was almost identical. Some representatives were sent from the Yamato court to become officials in the Korean kingdoms of Silla and Paekche and there were also examples of people from the Korean peninsula playing an important role at the Yamato court. The bilateral relationship could be described as blending into one harmonious whole. Moving forward to the Edo period, despite the Tokugawa Shogunate’s closed country policy, Korean envoys visited Japan on 12 occasions, the only official diplomatic contact during that time. As we can see, the ROK and Japan have traditionally engaged in ethnic, cultural, political and economic exchanges in their position as each other’s closest neighbors. Yet the current bilateral relationship has been such that it has not been possible, until now, to hold a leadership summit. To rectify this situation, both nations need to discard their arrogance and their distorted view of each other, and work together with humility and good faith to develop a friendly cooperative relationship. France was invaded by the Nazis, but now enjoys extremely amicable relations with Germany. Meanwhile, the United Kingdom and France, which had previously engaged in a hegemonic struggle, dug the Channel Tunnel between their two nations and are now connected by the high-speed Eurostar train service. If 21st century Japan can emulate the bilateral relationships between France and Germany and the United Kingdom and France, and consider the Japan-ROK relationship from a broader perspective, it should be able to move the relationship in a positive direction. To achieve this, Japan must create a true relationship of trust by adopting a stance in which it looks calmly at the historical facts, apologizes where apologies need to be made, and makes corrections where corrections are needed. In the ROK meanwhile, people are still trapped by the facts of past history, and anti-Japanese education and rhetoric needs to end. It should be natural for both countries, considering their close relationship, to overcome the difficult issues they face and work more closely together, and this I believe is something the majority of citizens in both Japan and the ROK desire. In 1990, Korean President Roh Tae-Woo addressed the Diet while on a visit to Japan, urging, “Let’s work together to create an era where in the next century young Japanese can depart from Tokyo and travel through an undersea tunnel to the Republic of Korea, where they can embark a voyage of friendship with their Korean counterparts, a voyage that takes them to Beijing, Moscow, Paris and London, spanning continents and linking the world together.” I was very much impressed by this statement. I am convinced that now is the time for Japan and the ROK, as each other’s closest neighbors ethnically, culturally, and linguistically, to work closely together in order to realize this dream.